Details: Every Year the American Legion Post 54 and Ladies Auxiliary host a Easter Egg Hunt on Easter Sunday. Free for Kids Ages 3-12 years. 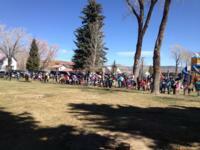 Official Start is 1:00 sharp, and the egg hunt lasts about 20 seconds! There are several "special eggs" with prizes too!